The new ASID Interior Design 2015/2016 Outlook and State of the Industry report is now available for purchase. The report provides evidence that the interior design industry is strong and growing and that it has fully recovered from the recession. The total number of employed interior designers (60,824), the total number of design firms (13,257), total sales ($8.6 billion), and the dollar value of products specified ($68.5 billion) are now approaching or above pre-recession levels. Interior design is evolving, too. Macro-trends that affect all of us (Health & Well-being, Technology, Sustainability, Urbanization, Globalization, and Resiliency) are changing the topics we consider when working on design projects. And each macro-trend has its own set of sub-trends. Holistic design thinking and higher sustainability standards are identified as the most transformative, while designing for healthy behavior and the Internet of Things are two of the fastest moving. Share your voice and make an impact on the future of health and wellness through technology and smart design. ASID and IDC (Interior Designers of Canada) believe that individuals and technology have the potential to impact health and wellness on a global scale. Join us for the inaugural Impact Summit on Health and Wellness in the Built Environment that will bring together thought leaders from interdisciplinary fields to consider how the power of smart technology can influence the future of health and wellness through interior design. ASID and IDC seek to foster action through insightful and provocative programming designed to help members and participants connect, collaborate, and drive ideas to action. Help us make an impact on a healthier future for all. Learn More and Register. 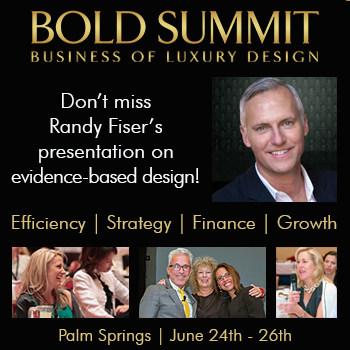 ASID CEO Randy Fiser will speak on the research and issues surrounding evidence-based design with a focus on creating spaces that satisfy a client’s fundamental physical and psychological needs, and the effects of space planning, acoustics, visual elements, and materials. Learn more. This year's gala event will take place on Saturday, July 18 at one of the largest art museums in the U.S., the Museum of Fine Arts, Boston. Interior designers and industry manufacturers made their way to Chicago for NeoCon this past week. Many stopped by the ASID booth to learn about the programs offered by the Society and checked out the ASID video wall that offered information on ASID and the interior design profession. They also enjoyed powering up at the ASID fueling station where coffee and mobile charging kept attendees revved up. 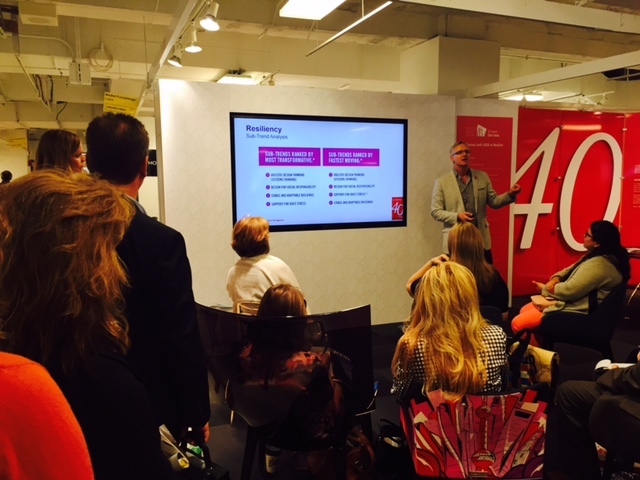 ASID NeoCon highlights included a standing-room only press conference on the latest industry data and trends from the new Interior Design 2015/2016 Outlook and State of the Industry report, an ASID reception hosted by Allermuir, a luncheon put on by the ASID Illinois Chapter, and a packed Career Exchange and tradeshow tour for students. 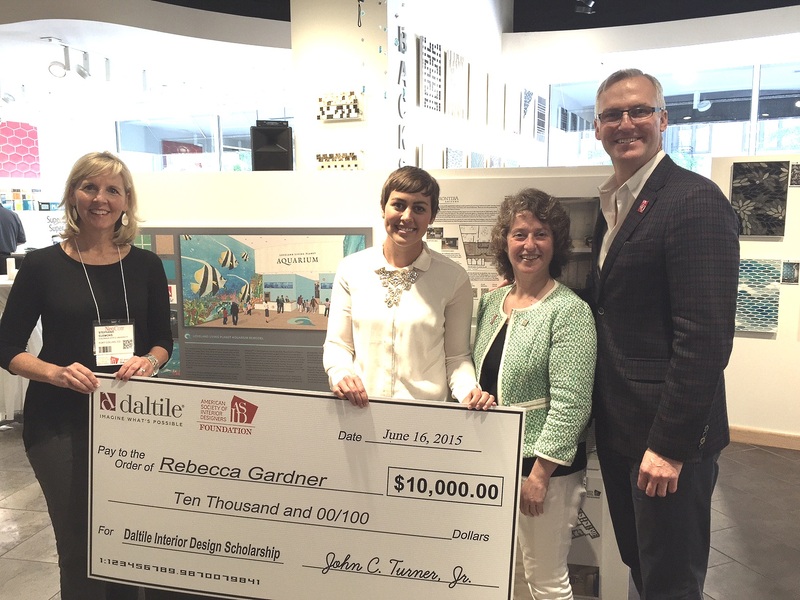 On June 16 at NeoCon 2015, the ASID Foundation and Daltile honored Rebecca Gardner as the winner of the fourth annual Daltile Interior Design Scholarship. This year’s challenge, Design with a Greater Purpose, asked students to select a non-profit organization as a pro-bono client and to address the needs of its users by transforming their current space through excellence in design and creativity. As the grand-prize winner of the competition, Gardner was presented with a $10,000 scholarship and her winning design was on display at the Daltile showroom during NeoCon 2015. Gardner, a recent graduate of Brigham Young University, received this year’s top honor for her redesign of the Loveland Living Planet Aquarium, a non-profit organization in her community that strives to foster education and stewardship of the earth and its ecosystems. She transformed the aquarium’s interior to better support Loveland’s mission of inspiring people to explore, learn, and discover. 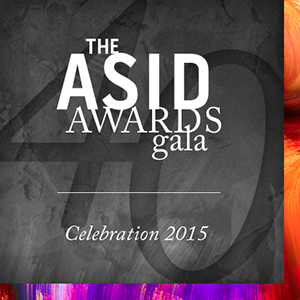 Cosentino Centers across the country will host an ASID 40th Anniversary Bash during the week of July 20, 2015 with all proceeds benefitting the ASID Foundation’s important work. All ASID Chapters are encouraged to participate and attend. A $20 donation per person is recommended for a great evening of networking opportunities, wine and hors d’oeuvres, a silent auction featuring items donated by Cosentino and local Chapter members, and much more. The Cosentino Center that raises the most money will win a hosted party for the local ASID chapter and Cosentino employees. More details and a full schedule of events will follow. What’s trending now? Packed with the picks of eight home design experts, the High Point Market Style Report for Spring/Summer 2015 names the spring and summer seasons’ design trends—and the products that embody them. Houzz recently released the results of a survey of 170,000 U.S.-based homeowners conducted between February and April 2015. The study on existing and emerging industry trends for 2015 found many baby boomers plan to age in place, spending money to modify their current homes. Outdoor living spaces and new technologies have also gained popularity, while spending remains high on core rooms such as kitchens and bathrooms. The Council for Interior Design Accreditation (CIDA) is asking the design industry to comment on the first draft of its Professional Standards 2017, the culmination of two years of research and analysis. The council asks for input from interior design educators, practitioners, employers, students, and members of allied fields. Hotels have scented their lobbies, elevators, and other public spaces for years. In the past, housekeepers at luxury properties would refill hidden, thimble-sized, clay oil dispensers. Now scenting is high-tech, involving building engineers and motorized compressed cartridges. Lately, hotels, airlines, and amusement parks are using less ubiquitous, more bespoke fragrances, and savvy guests are picking up the scent. Literally. When design research builds on design practice, it can contribute to both the theory and practice of design. Research faces several tensions that it must negotiate successfully in order not to lose its character as research. The crux of practice-based design research is that, where classical research is interested in singling out a particular aspect and exploring it in depth, design practice is characterized by balancing numerous concerns in a heterogeneous and occasionally paradoxical project. Failure to manage and record your time properly may be costing you money. Here’s why. “Mind your own business” could well be the motto for many small design firms. Usually, it’s the owner or principal who’s tasked with managing the staff, checking the books, and paying the bills. But if yours is a somewhat bigger to medium-sized firm or larger, you need to entrust the day-to-day management to someone else. Most interior designers are so busy working on client projects and managing their business that marketing often ends up on the back burner. When that happens, sometime in the near future, your phone will ring less often. What if you could get someone else to do your marketing for you? Need or Not? Fee or Free? If I’m a homeowner or a commercial office manager, do I really need to have the interior design services you offer? In other words, are you a necessity or a frill? A need or just a want? Should I consider you a priority or just a possibility? Interior design professionals lose a whole lot of business because they don’t address those questions in their promotional materials. Five billion; that's not a population statistic, that is the amount of plastic, in tons, that currently exists on Earth, according to George Elvin, author of “Post-Petroleum Design.” According to Elvin, whose new book gathers case studies and stories of material science innovators, our dependence on the synthetic substance will wane as designers and architects invent new bio-plastics, engineer sustainable substances, and rediscover new ways to work with old materials. The High Performance Building Congressional Caucus Coalition (HPBCCC) unveiled its 2015 Policy Priorities for the 114th U.S. Congress during High Performance Building Week. The document marks a first for the Coalition that can serve as the framework for advocacy efforts on Capitol Hill. HPBCCC is made up of approximately 200 organizations, including ASID, and provides guidance and support to the High-Performance Building Caucus of the U.S. Congress. Though eco-conscious retirement communities are still rare in the United States (exact figures are scant), they are expected to grow in number as baby boomers age and seek healthier, greener alternatives. “Moving forward, in the next 20 years, these green communities will become the standard,” says Andrew Carle, director of the senior housing administration program at George Mason University in Fairfax, Va. Interior design isn’t just about creating a home that looks new and current. It can also be about preserving the past and respecting the character of an older home. If you’re lucky enough to have a house with some time-earned character or an apartment with a certain quirky charm, consider these tips for addressing the issues that need a touch-up while bringing out the best of your home’s past, present, and future. Though smart toilets are just starting to make their way into the U.S. market, they are part of the growing trend of personalization in bathrooms – offering ways to address common bathroom shortcomings (not enough space, not enough light) while providing a luxurious experience. Although traditional styling remains the norm, the demand for contemporary styling and modern, unique functionality is growing. In its most basic understanding, the exercise of programming involves gathering and analyzing existing data, discussing client needs, and assessing facilities. The final product is a list of departments and space needs with criteria that meet code requirements. However, healthcare spaces are arguably the most complex of any building type because life is often in the hands of the caregivers working within them. It’s tempting to generalize workplaces in the tech sector as amenity-rich, open-plan spaces filled with millennials collaborating. Although there are plenty of workplaces that support this generalization, tech workplaces offer numerous lessons that can benefit other sectors. Beyond space and programmatic considerations, four tenets highlight today’s tech workplaces: strength of story, design empathy, technology presence, and hackerspace. Perhaps it is the “living” part of the equation that takes healthcare design into a place that is person-centered - it reflects how all of us live our lives versus focusing on a medical diagnosis. There is a special culture around this segment of healthcare and about being a senior living designer, including a lot of heart. Designers have the ability to maximize independence, lifestyle, and community living – or not – in the designs that they develop for elders, as well as the general population. With the desire for healthy eating, exercise, and all-round wellness on the rise (particularly among the younger generation), creating an appealing environment for guests at a hotel's fitness facility is paramount. It is easy to spot where some hotels are excelling in this realm.